George is from a long line of livestock farmers. Having spent all his youth growing up on farms he has a passion for all things cattle especially the Simmental breed. Over the last few years he has been using his skills to completely transform a local cattle enterprise and turn it into a progressive beef unit. With George’s knowhow and a massive investment by the owners it has gone from a 40ish cow herd selling all calves as stores to a 100-plus herd finishing everything on farm. George does all of this single handed. George has also gained many qualifications over the last few years to help him to reduce costs by doing all the previously-outsourced work himself. As well as establishing our own herd of cattle, George has played a major part in establishing a new pedigree Red Aberdeen Angus herd using new genetics imported from Argentina. He dealt with the whole process from importing them from Argentina to calving the first batch of calves. 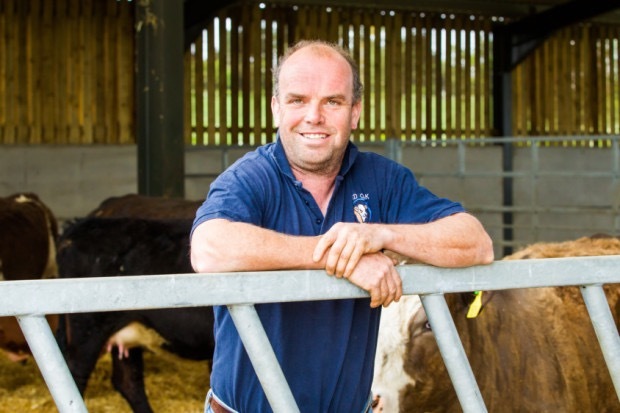 George has also played a major part in developing the new farm complex for the herd he looks after, this means he now has direct contact with some of the best specialists in the cattle building design world. • Using social media to keep people informed what is going on day to day. • Hosting an Open Farm Sunday event attracting over 400 people. • Hosting the Aberdeen Angus Youth Development Program. • Producing an annual calendar using pictures of the cattle through the year, giving it to friends on social media etc. • Establishing a beef box enterprise to supply beef direct from the farm. • Giving talks to local people so they can learn more about what we do and hosting events for AHDB Beef & Lamb. George was an early user of the MooCall calving sensor and is using thermal imaging to help reduce antibiotic use, he is also looking into other uses for thermal imaging in the herds and is the owner of Miracle Tech. He is an active member of Towcester Vets Beef Discussion Group, a member of the AHDB Progressive Beef Farmer Group and Dawn Meats Progressive Farmer Group.